The cowboys and cowgirls gather in Diamond Basin after sunrise. They unload their cowponies and cowdogs and head up into the foothills of the Owyhees. The cows are scattered from here to Silver City and beyond. This first Gather is the easiest. They get the cows they can see in this big valley and up the sides of the hills. The next times they have to start looking for the cows. "It'll take from now till Thanksgiving to get them all!" a cowboy says. He's not kidding. The fall weather is mild, the sun and dust golden. The cows bellow as they move on down out of the higher country, headed for winter on the ranch in the warmer Snake River valley, with the cowboys and cowgirls flanking and pushing them along. Silence falls over Diamond Basin. Dust settles in the hoofprints in the sand. Loved The Gather; spectacular photos of people trying to make a living. From the photos, you can easily picture yourself seeing something from a era that has come and gone. 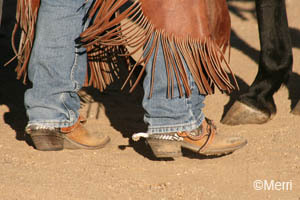 My the real cowboy never disappear from our prairies.